Hello! 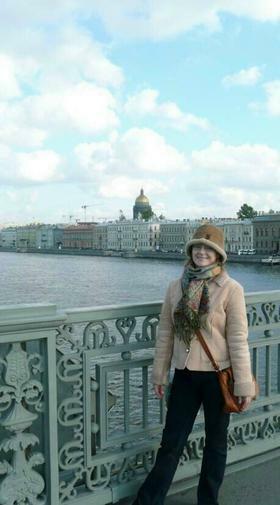 My name is Anya and I am a tour guide in St. Petersburg. Please allow me to tell you a little about myself. This way you can know something about me before selecting the guide you would like as your personal tour guide in St. Petersburg. I earned my college degree in 1997. After graduating from college, I continued my education and became a licensed teacher of foreign language and a personal tour guide in St. Petersburg. Currently I am contracted to guide through Palladium Travel Company. My expertise as a guide and their resources as a tour company mean that you have everything you need for an exciting visit to St. Petersburg. During the day, on weekends and on some evenings, I provide services as private tour guide. In the evenings I work as a language tutor for pupils ranging from kindergarten students to students who are studying in college. Being a tour guide gives me a great chance to meet people from all over the world. My passion is traveling, so I look forward to sharing my passion with you when you visit St. Petersburg! All of my immediate family members live in St. Petersburg and we are extremely close. I was born St. Petersburg and I have seen so much change! When giving an excursion, it is hard even for me to imagine how much is different and that this is still the same city from my childhood. The quality of life has drastically improved throughout Russia and St. Petersburg is now a developed European city. As your guide in St. Petersburg, I can share stories with you about life during and after the Soviet regime. This is one example of a story I often tell when I am giving an excursion in St. Petersburg. As a little girl I remember going to St. Isaac's Cathedral and seeing a giant pendulum hanging from the ceiling. The pendulum was hung from the top of the cupola and covered a painting of a dove. The purpose of the pendulum was to demonstrate some of the laws of physics and to prove that the earth is rotating. Religion was outlawed by the Soviet government and as a young girl I did not realize that all the beautiful icons and pieces of art had been removed or covered. In their place were pictures of Soviet politicians and Soviet propaganda. After the fall of the Soviet government, St. Isaac's Cathedral was thankfully restored to its original beauty and most of the Icons have been returned. The quality of life in St. Petersburg and Russia as a whole has improved so rapidly in the past 20 years and now you can find all the comforts of life that you would expect to find in Paris, New York or London. My goal as your private guide in St. Petersburg is to give you once-in-a-lifetime opportunities. I can show you all the sights and attractions in St. Petersburg that people usually visit like Catherine's Palace or The Church on Spilled Blood. In addition to visiting these places, I can offer you unique opportunities. Perhaps you would like to have a private canal boat tour or go onto the Neva River in a private high-speed boat. Please be sure to tell me if you'd like to see anything special like a ballet, antique vehicles, Free Mason history, Jewish history or any other area of interest. Thank you for reading a little about me. If you'd like me to be your tour guide, please visit my St. Petersburg excursion request page . If you'll be arriving by cruise ship, then I recommend that you visit my cruise passenger special page . I'm looking forward to being your St. Petersburg tour guide!